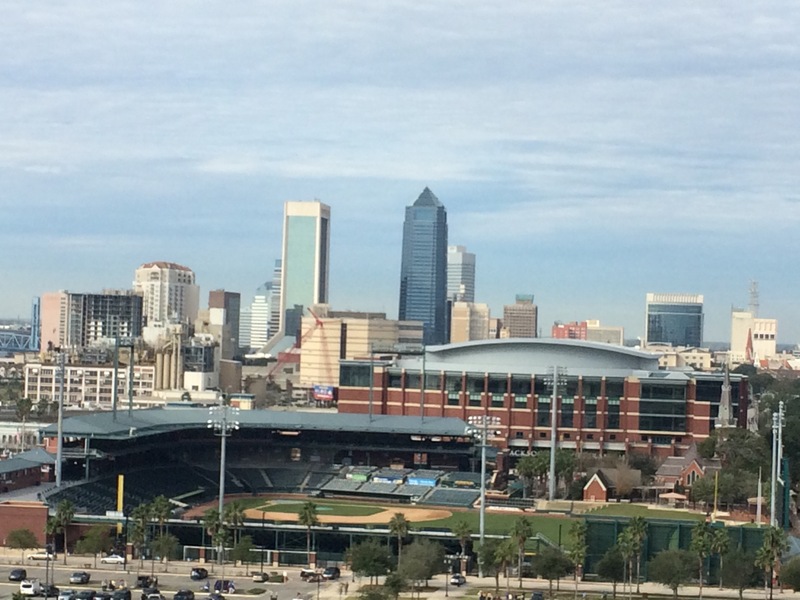 Sunny Jacksonville…the prettiest city with a terrible NFL team and the site of the college football game formerly known as the Gator Bowl. It’s now the TaxSlayer Bowl, which sounds more like a breakfast cereal container decorated with the IRS’s promotional superhero than Georgia Tech’s postseason destination. Since my dad earned his master’s degree in mechanical enginerding (not a typo) from the aforementioned institution, I grew up rooting for the Rambling Wreck–primarily because I enjoyed an expletive-free football watching experience, but I have since become more invested in Georgia Tech’s actual athletic progress. I had no qualms escaping the dismal winter air of Virginia for a short Florida trek to watch this football game and reconnect with my birth state. So I hopped in the car with my dad and Joe and one long I-95 excursion later, we were in the Sunshine State. The chilly air from the north sadly followed us south, and our first full day of sun was accompanied by mid-50s temperatures. I met up with my friend Caroline and her pals from their old Kentucky home, who had made a journey to the beach for a more conventional reason–to go to the beach, that is. Caroline, who lives by Edison’s quote “genius is one percent inspiration and ninety-nine percent perspiration,” tried really hard to get us to a nearby putt-putt golf course. But after we realized that the course may or may not have actually existed, we settled for a long walk on the beach. Actually, the walk itself was relatively short. But I did channel my inner Celine Dion (which becomes my outer Celine Dion more often than you’d imagine), or whatever character in the movie Titanic actually assumes this pose. 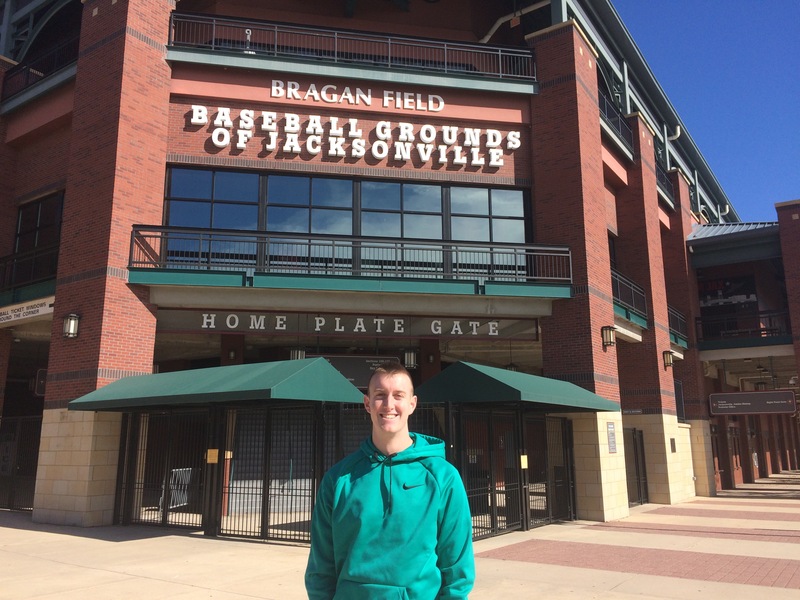 Following Jacksonville Beach, the next stop on our northern Florida reality tour, per my discretion, was the Baseball Grounds of Jacksonville–the home of the newly re-monikered Jacksonville Jumbo Shrimp. The oxymoronic baseball team is the double-A farm club for the Marlins, and I highly approve of their new nickname. Also, their logo is much cooler than that of its Jacksonville Suns predecessor. The park itself is lovely-looking. The only other double-A baseball stadium I’ve visited is The Diamond here in Virginia, home of the Richmond Flying Squirrels. Jacksonville’s is significantly newer and much more urban. It looks like a dwarf version of any number of new MLB parks. The brickwork is much like what you would find at Camden Yards or PETCO Park, and the exterior blends right in with the city’s surroundings. 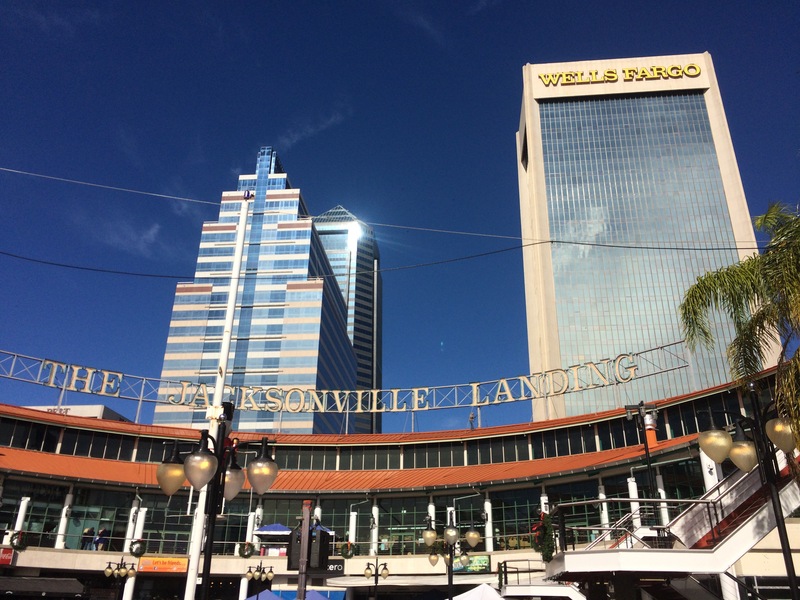 And the final stop before the game was Jacksonville Landing, which is a small entertainment area on the St. Johns River in downtown Jacksonville. Georgia Tech and Kentucky both held their official pep rallies here, so the place was swarming with college football fans. The real purpose of this whole trip, though, was the gridiron. 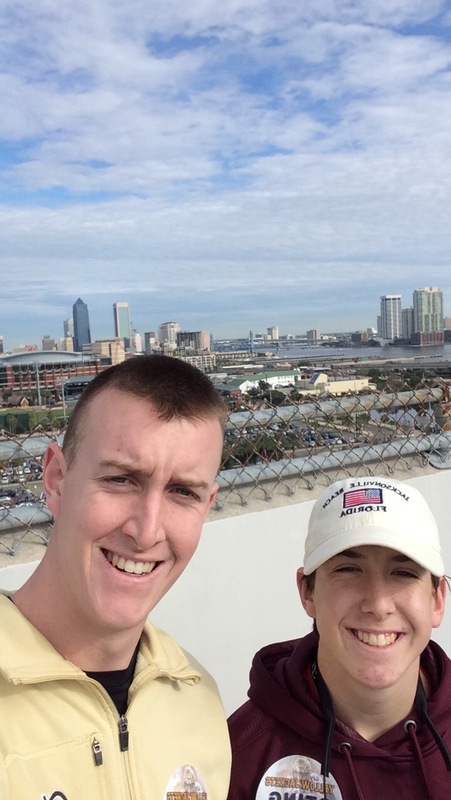 And the Yellow Jackets happily came out on top 33-18 in a fun bowl game the next day.